Lake Tekapo is a resort village and lake in the Mackenzie Country in the South Island of New Zealand. Surrounded by mountains and far from the glare of city lights, Lake Tekapo's cloud free skies make it one of the best places in the Southern Hemisphere to see the night sky. Local light-pollution laws require all exterior night-time lighting to shine down onto the ground, rather than into the sky. World heritage status is currently being sought for the whole area as the world's first starlight preservation area. Lake Tekapo's about 60 km by road north of Twizel on State Highway 8 (the Central Southern Alps Highway), three hours south of Christchurch and three hours north of Queenstown. Chill out by the lake and take in the splendour of one of the most beautiful places you'll ever visit! 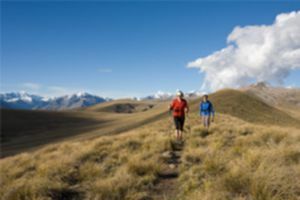 Tekapo Trek 3-day guided alpine walk in the foothills of the Southern Alps, overlooking Lake Tekapo. [email protected] or ☎ +64 3 680-6736. Air Safaris ☎ 0800 806 880 (toll free) Fly over New Zealand's highest mountains and most spectacular alpine scenery. Earth & Sky Observatory Tours, (Beside the Godley Hotel - opposite Caltex), ☎ +64 3 680-6960, . 10:00-late. Come on an Earth & Sky tour at one of either of two observatories - the famous Mt John Observatory (a research station run by the University of Canterbury, now also hosting night tours and a stunning cafe) or our smaller, more private observatory nearby at Cowan's Hill. On clear nights we can show you the wonders of the night sky. If it's cloudy, come and see areas of the observatory normally closed to the public, and learn about the scientific work done here. Astro Cafe, Mt John Observatory (drive along Godley Peaks Rd (off the highway, just south of Tekapo Village) until you come to the gate), . Summer 09:00-18:00; Winter 10:00-17:00. Described in Lonely Planet as "possibly the best place on the planet for a coffee". Stunning views, lovely walks, and delicious coffee and food! If you're lucky, you may catch an astronomer floating about to give you a short tour of the observatory, or perhaps show you a star (or the sun!) in the daytime through special telescopes. Drive time from Tekapo is only 15 min, or you can walk up, starting by Alpine Springs Hot Pools (walks take between 45 min to 1.5 hr each way). This is definitely a spot not to be missed. Quality cottages and apartments to suit a variety of tastes and budgets. Full of character, and very close to the Lake, shops, and Church of the Good Shepherd. Offers a beautiful view over the lake and the church while you enjoy your breakfast. The ground floor has three rooms and a lounge. The garden is relaxing. Offers over 30 self-contained holiday homes, many with breathtaking views of the lake and mountain range. Independently owned and operated. Situated 300m from the lake front shops and bus stop. Aoraki Mount Cook National Park is about 100km by road to the west. This page was last edited on 2 November 2018, at 07:58.